The last couple of weeks at the Tyler SSPI program have flown by! 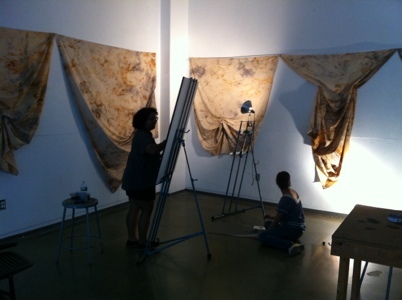 I’ve been rust dyeing a lot of fabric, but there is limited studio space so I hung them in a crit space down the hall. Shortly after, I realized that a couple of the summer program high school students were setting up easels and drawing my fabrics as still lifes. What an ego boost! Two of the high school program’s professors also took time to chat with me about the fabric as well. There has been plenty of chatting going on about work in general. The revolving door of guest artists thus far has been really impressive, and certainly one of the major highlights of the program. Besides having critiques with the SSPI professors, I have had individual critiques with sculptor and head of Tyler’s sculpture department Jude Tallichet, and painter and Tyler professor Echo Eggebrecht. Today, we had a 6 hour group critique with painter and Tyler professor Dona Nelson. I am definitely not short on opinions or points of view! They have all given me a lot to think about in terms of what my finished work at the gallery show should be. It can be tricky striking a balance between your own judgement and that of others, especially if it’s coming from a seasoned professional. It all comes down to confidence: do I have big a big enough pair to create my vision? We shall see! Category: My Work, Tyler SSPI.